Put your company logo on our wide selection of colored golf balls for your next golf tournament, event, outing or promotion. 4. Your colored golf balls will be produced and shipped followed by a tracking number sent by email. Custom Logo Colored Golf Balls. Golf balls are generic balls with no factory markings. Packaged bulk with no sleeves. 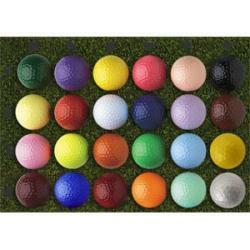 Colored Golf balls are playable on the course with a 2 piece design made for maximum distance. .. Golf Balls are white, with no factory markings on them. Packaged bulk with no sleeves. Priced per dozen. Price Includes Full Color Logo..